With the Western Conference landscape on solid ground, we look to the Eastern Conference for trends and chaos. While the Western Conference playoff bracket appears streamlined by the certainty of its top teams, the East has a sort of charming disorder. Three teams vie for the eighth seed. As many as five could challenge for third. All among them seem to live in a fairly radical flux that, if a certain number of variables align, could pave the way to an Eastern Conference finals berth. Given that Cleveland is in a world all its own—both in terms of drama and potential—we dug into some of the key trends elsewhere in the conference for a glimpse of how the East might shake out the rest of the way. Most every Hawks regular is doing an impressive job of marking (and removing) the easiest play away. What should be a routine pass out of pressure is instead denied and deflected. Even those possessions that don’t end in a turnover still stall out an opposing offense by taking away what’s comfortable. Reserve wing Thabo Sefolosha is the embodiment of this ideal. Opponents looking to create against Sefolosha often seize up when their operating room is contested. Those working in other matchups are made to think twice by the way Sefolosha looms, eager to pounce on any pass that floats in the air for too long or veers within range of his comprehensive wingspan. The result of that general approach in Atlanta is the best defense in the league since the turn of the calendar year, per NBA.com, with a dominant mark of 96.4 points allowed per 100 possessions. So dispiriting is the Hawks’ pressure that it forced the Pacers, who were held to a season-low 75 points in their game against Atlanta on Sunday, into some immediate soul-searching. A defense can be fairly measured by the amount of crisis it creates. Atlanta guards like a team comfortable with itself and fully in tune with its core mechanics. Rotations are tethered so that defenders move in unison—that elusive on-a-string quality materialized through the Hawks’ continuity. None of this would be possible without Al Horford and Paul Millsap. Atlanta’s bigs are the stars of the system for the way they buy their teammates time; both are quick enough on their feet to ward off ballhandlers, take away jumpers, and control breakdowns. Their many, focused efforts over the course of a possession are what give the Hawks’ system its fluidity. Every circle on that chart represents one of the 35 Bulls game since Jan. 1. The red circles indicate a game played in which five of those seven core players were active. Chicago has been lucky to get four such games in a row; just as one player comes back from injury, another seems to fall out of the lineup. Even when a key player does return, the time it takes him to get back up to speed tends to force the Bulls into more compromises and adjustments. This team has desperately needed to find its working chemistry and yet never quite could. Without a largely healthy roster, Chicago doesn’t have the depth or the intangible boost to be at all reliable. Overall, that dynamic has torpedoed the Bulls’ performance. Over the last 15 games, Chicago has been outscored by 6.1 points per 100 possessions—almost equally bad as the Warriors (+5.9 points per 100 possessions) were good. For as much as the Bulls fancy themselves as a team of import, their statistical neighbors in recent weeks have been the likes of the Pelicans, Kings, and Lakers. There’s a solid (if flawed) team in here, somewhere. 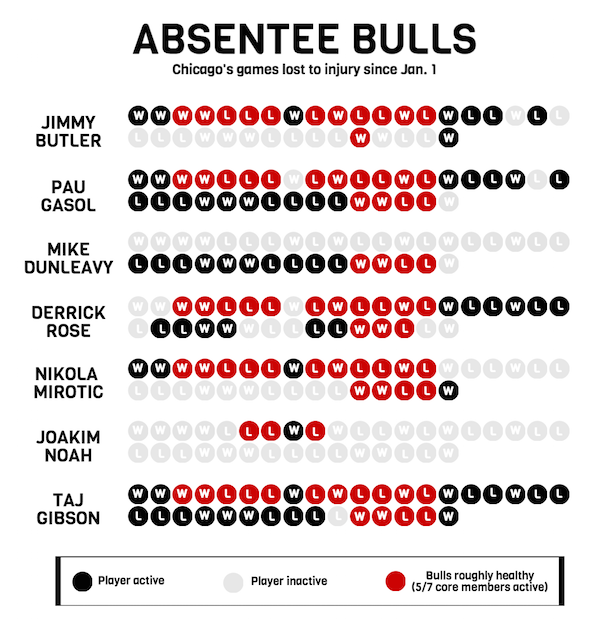 It just doesn’t manifest often enough for the Bulls to be at all trustworthy, in large part because Chicago’s injury luck has denied them the opportunity. Charlotte’s seven-game winning streak finally fizzled out on Monday against the Mavs, though any consistent stretch like that will do wonders for teams within the crowded middle of the Eastern Conference. The Hornets now sit just two games in the loss column removed from No. 3 seed and in a virtual lock with Atlanta at No. 5. It’s not inconceivable that Steve Clifford’s team could host a first-round series next month, a feat which should have been impossible given how many games Michael Kidd-Gilchrist and Al Jefferson have lost to injury. The Hornets found their way. A soft stretch of schedule has been rather accommodating, particularly in the case of Kemba Walker. Charlotte’s near-All-Star has punished the lesser opponents on the schedule in recent weeks by dropping 30 on the Sixers, 34 on the Wolves, 34 on the Pelicans, 28 on the Nets, and 33 on the far-better Pacers for good measure. The next few weeks look just as fortuitous; between now and the end of the season, the Hornets will play the Magic, Sixers, and Nets twice, along with the Bucks, Nuggets, and Knicks. Throw in winnable games against the Pistons, Heat, and Celtics and one of the more favorable remaining schedules in the league takes shape. Even if Walker were only to torch the league’s lesser teams the rest of the way, the Hornets would still stand to be in favorable playoff position. Charlotte is still feeling out the best ways to use Jefferson and recent addition Courtney Lee, who together solidify the Hornets’ rotation. Jefferson isn’t just a post player for this team; the Hornets bring their plodding big man up to the elbow to execute dribble hand-offs and the like to keep the offense moving and the perimeter active. Lee is still feeling his way through possessions defensively, though his spot-up shooting and movement without the ball have made him a natural fit with Charlotte’s revamped offense. Another recent trend is particularly clear: So long as Walker and Nicolas Batum are on the floor, the Hornets tend to blow out all but the best teams in the league. The two play off one another beautifully as counterpoint shot creators, capable of receiving a pass from the other on the weak side and immediately attacking a defense mid-rotation. Both have grown into their current roles beautifully. The second-best team in the East has won 10 of its last 15 games despite increasingly porous work in coverage. Only a handful of teams have allowed more points per possession in that span, and among them only Dallas has any playoff hopes whatsoever. This is dangerous territory; Toronto’s offense is good enough to carry the team for long stretches now but not so dynamic as to do the same in the postseason. Two-way play will be essential to the Raps’ playoff viability. They’ve proven capable of it in spots, just not in any sustained fashion of late. In particular, Toronto’s already lax three-point defense has hit a concerning new low. Evaluating a team’s defense of the three-point line based on shooting percentages alone can be fickle; sometimes the randomness of three-point shooting can inflate or deflate the opponent’s shooting percentage arbitrarily. Stretch out the data over a long enough sample, however, and a clear trend emerges in the bump the Raptors give to their opponents. Toronto has one of the worst margins in the league when it comes to their opponents’ three-point shooting relative to their respective averages. In their 31 games since Jan. 1, Raptor opponents have shot 38.3% from long range, which is 3.1% better than usual. The reasons for this are many. Toronto will sometimes get caught in pre-rotation, in which its wings away from the ball slide over to defend as a pick-and-roll begins for the sake of the next play in sequence. They sometimes jump the gun in doing so, leaving a shooter unattended on the weak side of the floor. The same goes for when perimeter players dig down into the post or look to crowd the lane against dribble penetration. So concerned are the Raptors with containing the ball that they occasionally leave themselves vulnerable to a simple screen or curl elsewhere.